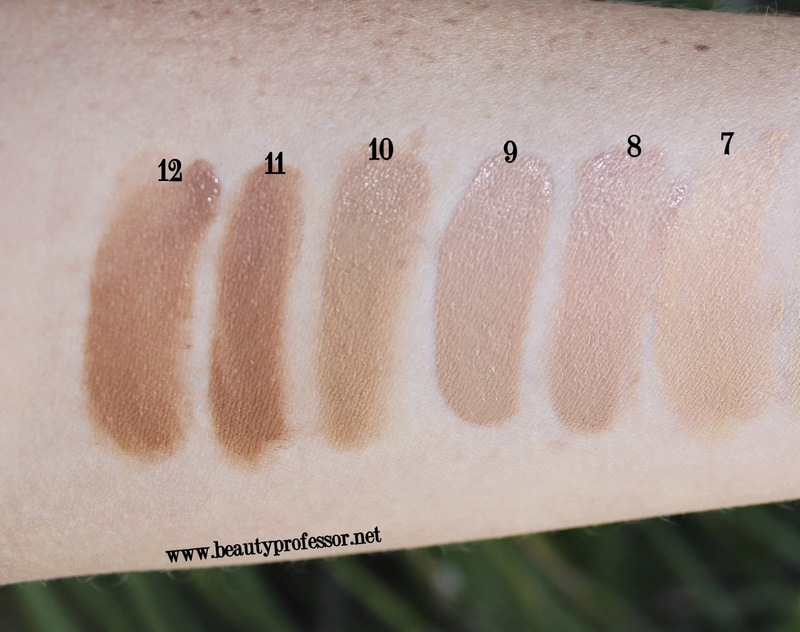 Beauty Professor: Le Metier de Beaute Classic Flawless Finish Foundation...New Swatches! 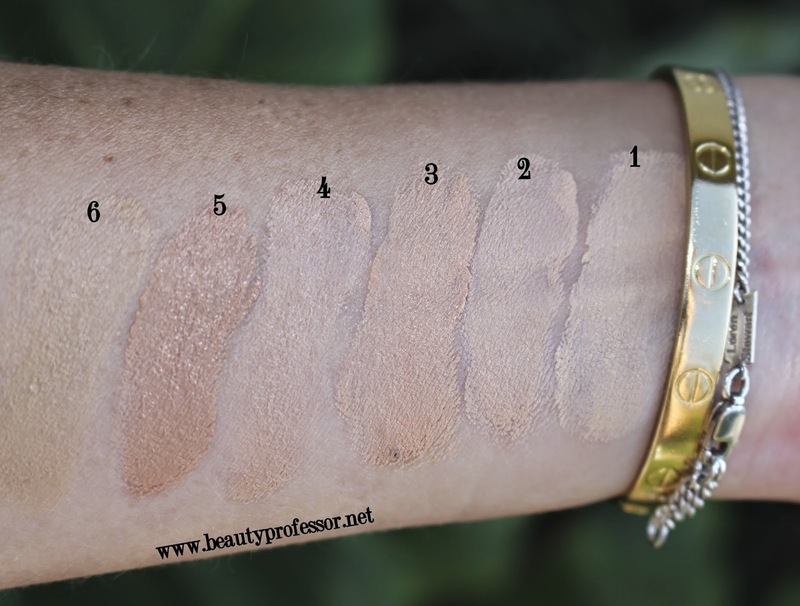 Le Metier de Beaute Classic Flawless Finish Foundation...New Swatches! 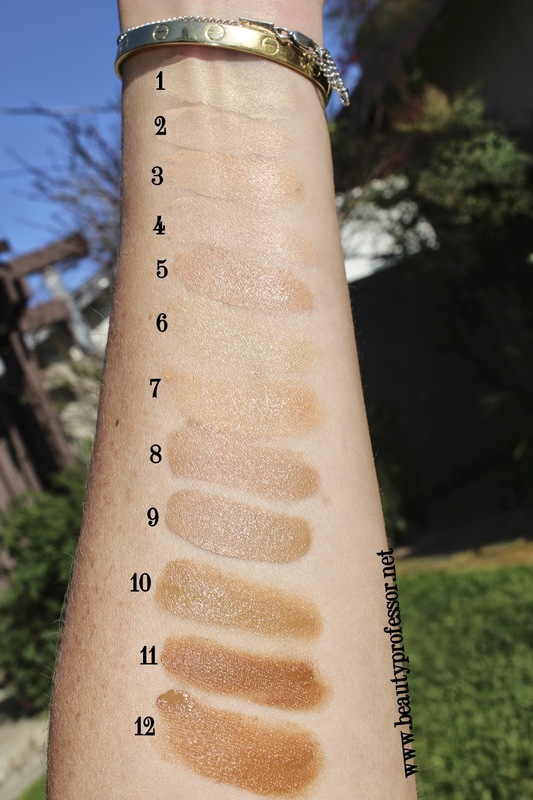 Above: All twelve shades of the Le Metier de Beaute Classic Flawless Finish Foundation on the cusp of being swatched. I have done an extensive amount of musing on the many merits of the Le Metier de Beaute Classic Flawless Finish Foundation. Past posts with a host of images and details can be found HERE and HERE. With twelve shades to match nearly every skin tone, from the lightest alabaster to the richest cocoa, this foundation is indeed a classic. A recent conversation that I had with dear friend and Le Metier de Beaute Director of Color Mikey Castillo (featured HERE and HERE) confirmed its utilitarian timelessness as we both agreed that this quintessential formula works extremely well on all skin types and ages. If you are on a quest for a medium coverage liquid foundation with supreme ingredients and the propensity to smooth and even skin with a dewy, undetectable finish, then it just may be time for you to discover your most befitting shade! Although I have previously swatched all shades (see the earlier links in paragraph above), I now have the luxury of a more capable camera and spectrum of lighting options, thereby necessitating a swatching update. Above: A visit with the LMdB luminaries (L-R) LMdB Artist Kayla Arielle, LMdB Director of Color Mikey Castillo, BP and LMdB Global Key Artist Ivan Castro at Neiman Marcus Fashion Island in April 2014. The lightweight, oil-free, light-diffusing formula evens out skin tone and imperfections for a luminous, natural look. 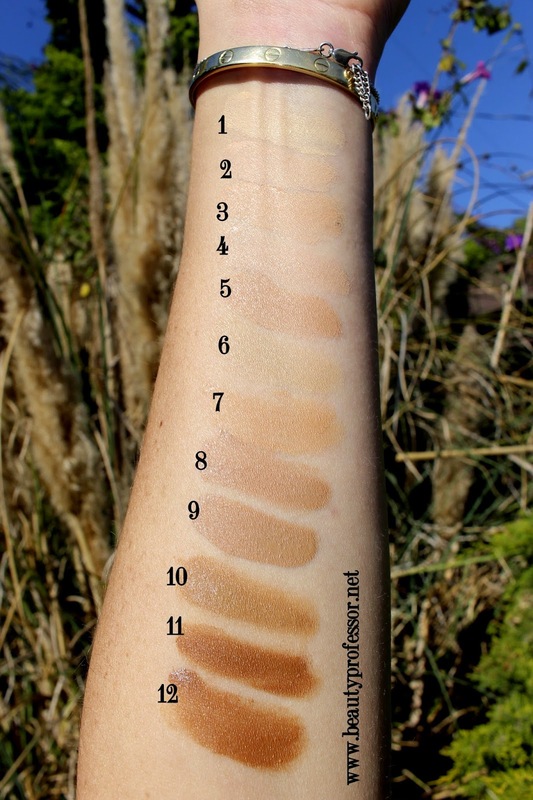 Above: Swatches of all shades in direct, mid-day sunlight. Above: All shades swatched in warm, late-afternoon sunlight. Above: The lighter shades swatched in shade. Above: The darker shades swatched in shade. Bottom Line: The Le Metier de Beaute Classic Flawless Finish Foundation is a formula for all seasons. The perfectly buildable medium coverage is skin-like and glowing and its ability to flatter skin of all types and ages is commendable! If you are looking for a truly classic luxury foundation with exemplary ingredients and remarkable performance, then the LMdB Classic Flawless Finish Foundation is a must. Available at Neiman Marcus, Bloomingdale's, Bergdorf Goodman's and Dermstore. Have YOU tried this formula? Thoughts? One quick question, this formula is suppose to be creamy texture, isn't it? Do you still wear the same shade? In my experience, this is a liquid foundation with creamy tendencies. I like to shake mine a bit (I have #7 and #9) before application to get the most consistent texture. Is the coverage of your #3 different than the #7? Indeed...and she is entirely sweet as well! I would suggest shade #6 or #7! Thank you for the swatches! I'm actually currently on the hunt for an incredibly stalwart foundation to wear to my honeymoon over the summer. We're going to Italy in August and it's supposed to be 95 degrees around that time, and as much as I adore my KS CP cream foundation (that I bought literally 6 backups of when you said they're leaving the US! ), it may not handle that kind of temperature. Do you think the LMdB one is a good option? Right now, I'm leaning towards GA Lasting Silk foundation, but I'm not really in love with it. It's just okay IMO. Any suggestions?? Happy to help, MG! The first time I tried this formula, I was in Palm Beach, FL in the summer and I found that that it held up beautifully, even with the excruciating humidity. Another option is the slightly more matte Cle de Peau Cream foundation (recently reviewed)...it still offers medium to full coverage and looks like real skin but is extremely resistant to heat and fading. I stumbled upon it by accident but have found myself grabbing for it a lot lately! With regards to your other option, I find that the GA Lasting Silk gives me flashback in photos and sometimes can look dry (at least on my skin!). Italy in August...that sounds incredible!! Can't wait to hear what foundation you settle on! I have to say, I am so flattered you have gotten to know me so well as a reader that you already know I would want to know about flashback before I could ask it! You also always comment on lack of shimmer in eyeshadows whenever I post a question, and I simply love how attentive you are to your readers likes/dislikes! Well, since I couldn't decide between these two foundations, I just wound up getting both the Cle de Peau and the LMdB foundation! I have a hunch I'll like the Cle de Peau better though, because it strikes me as slightly more resistant to humidity from the texture. I also am not a huge fan of the GA Lasting Silk, although I could never put my finger on it. I love how natural it looks when I apply it, but I find after a few hours, it catches onto the dry patches on my skin and make them look worse. It also separates on my nose, which does not look the best. I prefer the way the KS CP foundation fades--very evenly. Unfortunately, it doesn't have the lasting power I need for 95+ weather for 14 hour days. Hopefully one of these works out! If you have anymore suggestions, keep em coming! Also, what powder do you like to use with the Cle de Peau for the best long-lasting results? I'm currently trying to get my hands on the Surratt powder (the radiant one), but they're out of stock at the moment. But for now, I have LMdB peau vierge and Serge Lutens powders. Hopefully the Suratt will come soon! But of course, MG! We are makeup "kindred spirits" in so many ways and I am so glad that BP brought us together! I am so glad that you ended up with both foundations...they are lovely formulas and I think you'll definitely find use for both at different times ; ) The CdP is just so fantastic in warm and humid weather...seriously, it lasts forever. I feel like it is some kind of well-kept secret! I also suggest the Ardency Inn Custom Coverage Concentrate (full review with swatches soon). It is so pigmented that it can be mixed with moisturizer or primer for coverage of your choosing or used full strength as a concealer...and it is also very stalwart in terms of lasting power. You might like it as an alternative (and it is super affordable in contrast to what we're used to spending on foundation these days!). In terms of powder, I haven't found the need to set the CdP, but I have been using the Surratt powder, LMdB Peau Vierge powder, or, most recently, the Tom Ford Translucent Setting Powder in Ivory Fawn for mid-day touch ups! Love all three!